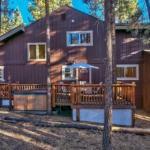 Located a 14-minute walk from Heavenly Ski Resort and 1.4 km from Tahoe Queen Heavenly Mountain Home provides accommodation situated in South Lake Tahoe. The property is 2.4 km from South Tahoe Ice Arena and 9 km from Washoe Meadows State Park. With direct access to a patio this holiday home comes with 4 separate bedrooms and a fully equipped kitchen. A flat-screen TV and DVD player are available. Aerial Tramway is 700 metres from the holiday home. Reno-Tahoe International Airport is 65 km away.